“When giving children books, well-meaning adults may feel impelled to offer challenge, too – opting for text-dense vocabulary boosters at the reader’s diagnosed level, with the difficulty ramped up a little for luck. However gentle, though, this sort of nudge is not an unalloyed blessing. It may pluck children out of storylines in which they were ecstatically resident; deny them the elegant plotting of a well-turned mystery, the satisfying structure of a pony story or the terseness of a comic adventure…. A frequent casualty of the utilitarian focus on advancement and sheer length is illustration, and the reader’s respect for it. The children told “You’re too old for picture books” are not only banished abruptly from an enchanted kingdom. They are also held back from winkling out images’ stored secrets of detail, and from learning the artist’s language of window-frame, colour, light, shade, emphasis, the single line that communicates mood, or loss, or season – everything we mean by “visual literacy”. Sophisticated, demanding concepts may also be com­municated, via illustration, to readers unable or unwilling as yet to parse the complex language required. “According to parenting and teaching educator Barbara Coloroso, childhood anxiety is an issue facing an alarming number of youth today. The subject is hit head-on in Small Things, an amazing and emotional new wordless graphic picture book for ages 8-12, by Australian artist Mel Tregonning. I received an advance copy from the Canadian publisher Pajama Press. It immediately reminded me of Shaun Tan’s book The Arrival, published in 2007. I never forgot this migrant story. Also wordless in graphic book style, it was the perfect way for the ‘reader’ to really feel what it would be like to arrive in a foreign country, not able to speak or read the language or understand the culture…. Mel Tregonning was obviously inspired by Shaun Tan’s work and created a similar opportunity for readers to see what it would be like to walk in the shoes of a child suffering from debilitating anxiety…. This is an important book for pre-teens and young teens that deal with or know someone that deals with anxiety. A must for middle grade school libraries and would be an ideal conversation starter for classrooms. 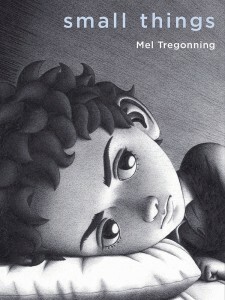 “Small Things by Mel Tregonning ($22.95, Pajama Press) is one of the most unique picture books I have read in a while…. Once I read that afterword, my first thought was Wow. What a powerful message with powerful illustrations.